The Detroit Wolverines visited Chicago’s West Side Park to battle the Chicago White Stockings on July 28, 1888, and “the result was a cannonading more terrible than any seen here this season.”2 The 1887 National League champion Wolverines (47-26) were looking to repeat as pennant winners and had assumed the top spot in the standings with a recent four-out-of-four stretch, including two wins against the White Stockings. Chicago (44-30) had lost six games in a row, dropping the team from first place to third. Jimmy Ryan, Chicago’s starting center fielder, led off with a single, driving “the sphere out to right field.”4 He moved to second on a passed ball and stole third base. An out later, Ryan scored when Hugh Duffy launched a home run over the right-field fence. Detroit answered in the bottom half. Jack Rowe doubled and came around on Deacon White’s single. In the top of the second, Tom Burns and Mark Baldwin drew walks. Burns was cut down trying to steal third (“on what the Chicago cranks thought a close decision”5), but Mark Baldwin scored when Tom Daly hit an infield grounder that led to two Detroit errors. Daly “walked in from second when Ryan hit the ball between the eyes and landed it among the benches near the Congress street wall”6 for a triple, extending the Chicago lead to 4-1. In the Detroit second, 12 batters came to the plate. Sy Sutcliffe started with a double to left-center. An out later, Lady Baldwin drove him in with a single. Count Campau walked, and Ned Hanlon knocked in two with a single, tying the score. Dan Brouthers’ single brought Hanlon home. The next four batters (White, Charlie Ganzel, Sutcliffe, and Larry Twitchell) reached on a hit, two errors, and a walk. Anson had seen enough from his pitcher and brought Ryan in from the outfield to take over the mound duties. The new hurler struck out Lady Baldwin with the bases loaded to end the inning, but six Wolverines runs had scored. Detroit’s Hanlon knocked a solo homer over the Harrison Street wall in the third, making the score 8-4 in favor of the visitors. In the Chicago fourth, Ned Williamson singled but was forced at second by Burns. Mark Baldwin, now playing center field, was “given a life on called balls.”7 Daly singled to left and Burns raced for the plate. Left fielder Twitchell threw home, but the ball went into the crowd and “before the ball could be found, three men had touched the plate.”8 In his third at-bat of the game, Ryan sent the ball over the right-field fence to “a vacant lot across Harrison street”9 for a home run. According to the Chicago Tribune, the crowd erupted with “a perfect bedlam of voices.”10 The score was once again tied. In the fifth the White Stockings kept the hit parade going. Williamson drew a walk on five balls, which were necessary for a walk in 1888 (in 1889, the National League lowered the number to four.11) Burns reached on an error and the pair scampered home on Daly’s triple. Ryan “pasted the horsehide over Twitchell’s head into deep left centre for another triple.”12 This led to another long round of cheering by the fans. Lady Baldwin was rattled and walked Marty Sullivan. At this point, Chicago attempted a double steal. While Sullivan raced to second, Ryan ran home, thinking the throw was going to second, but he was tagged out at the plate. The Wolverines answered with three runs of their own, on Campau’s single, Brouthers’ double (Mark Baldwin in center and Duffy in right collided while chasing the fly ball, which fell between them), and two errors. The score was again tied, 11-11. Chicago’s last burst of runs forced Lady Baldwin from the mound. He switched positions with Twitchell in left. Duffy greeted the new hurler with a single. Then Anson homered over the left-field fence onto Congress Street. Williamson singled and scored when Hanlon dropped Burns’s fly ball. Mark Baldwin drove in Burns with a single, and Chicago had posted three more runs. 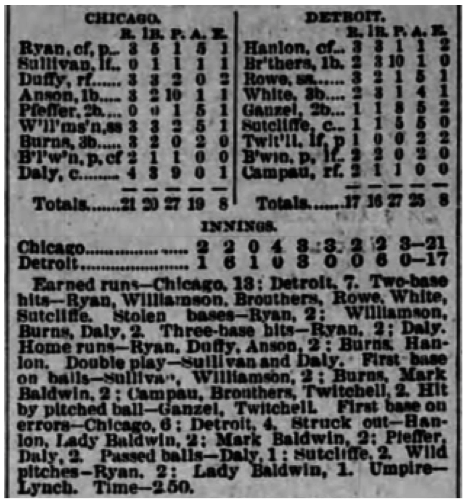 Detroit brought Lady Baldwin back to the mound in the seventh inning, but he “was pounded most unmercifully.”13 Ryan reached on a two-base error to left and Anson bashed his second home run of the game, this time to Harrison Street. After keeping Detroit scoreless, the Chicago batters took their hacks again in the eighth. After singles by Williamson, Burns (who was thrown out trying to advance), and Daly, Ryan “pounded out a two-baser,” giving Chicago two more tallies. The score was now 18-11 in favor of the home team. The double meant that Ryan had hit for the cycle. In the bottom of the eighth, Detroit stormed back, producing four hits, three men reaching on Chicago errors, one walk, and a hit batsman, and when the dust settled, the Wolverines had added six runs to their score. Going into the ninth, it was a one-run ballgame, and Chicago was clinging to its lead. Duffy led off with a single. Anson forced him at second and Williamson coaxed another walk. Burns then blasted a three-run home run to Congress Street. As Burns circled the bases, “an enthusiast sitting near the Chicagos’ bench danced a breakdown, to the great amusement of the Sec. H sitters.”14 That may have broken the backs of the Detroit players, as they were retired in order in the bottom of the last inning. Ryan struck out Lady Baldwin for the last out. The final score was 21-17. After 2 hours and 50 minutes of baseball, the fans went home happy but hoarse. The player of the game was Jimmy Ryan. In his six plate appearances, he had a single, double, two triples, and a home run, and he also reached on a two-base error. His 5-for-6 performance totaled 13 bases. He scored three runs, drove in four, and stole two bases. For the season, Ryan led the league in hits (182), doubles (33), and home runs (16), batting .332. His player-manager, Anson, set the pace for the National League with 84 runs batted in, a .344 batting average and .400 on-base percentage, and Cap had two hits, both homers, in this game. Ryan was only the 21st player in major-league history to hit for the cycle, and his accomplishment was the third of 1888, after Harry Stovey (Philadelphia Athletics, May 15 against the Baltimore Orioles) and Sam Barkley (Kansas City Cowboys, June 13 against the Cincinnati Red Stockings). Four weeks after Ryan’s feat, on August 25, Mike Tiernan of the New York Giants hit for the cycle against the Philadelphia Quakers. 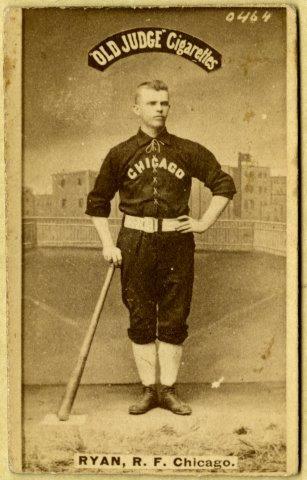 Three years later, on July 1, 1891, Ryan hit for the cycle for the second time, as his Chicago Colts defeated the Cleveland Spiders, 9-3, and tied for first place in the National League. As a pitcher, Ryan pitched 7⅓ innings. He allowed 10 runs and threw two wild pitches, but he also pitched out of a few jams. He struck out five Wolverines batters. He is the first major-league pitcher to hit for the cycle.15 For his pitching career, Ryan appeared in 24 games over five different seasons. In 1888 he pitched in eight games, starting two. He had one complete game and posted a 4-0 record with a 3.05 earned-run average (the National League’s average was 2.83). Regarding the “terrible cannonading,” the teams combined for 38 runs and 36 hits, 15 for extra bases. Only Chicago’s Fred Pfeffer and Detroit’s Twitchell were hitless. Chicago scored in every inning but the third. The 21 runs put up by the White Stockings were far and away their highest run total of the season, but they allowed more than 17 runs in three other games. The Boston Beaneaters scored 20 on May 15 and the Washington Nationals scored 22 on July 12; both games were played in Chicago. The Giants scored 19 runs at a June 8 game played in New York. In addition to the sources mentioned in the Notes, the author consulted baseball-reference.com, mlb.com, sabr.org, and retrosheet.org. Play-by-play was taken from Chicago Tribune and Detroit Free Press articles. Special thanks to Kevin Larkin for fact-checking. 1 Chicago played most of its 1888 home games at the West Side Park. However, baseball-reference.com, on the 1888 Wolverines schedule webpage, shows “Site change” in the game location column (baseball-reference.com/teams/CHC/1888-schedule-scores.shtml). Newspaper accounts cite home runs hit onto Congress and Harrison Streets, which were two of the streets surrounding West Side Park. 2 “Some Big Scores Made,” Times (Philadelphia), July 29, 1888: 2. 3 “Sluggers Outslugged,” Detroit Free Press, July 29, 1888: 4. 4 “Home Runs All Around,” Chicago Tribune, July 29, 1888: 14. Chicago won the toss and elected to bat first. 11 Official Major League Baseball Fact Book (St. Louis: The Sporting News, 2001), 276-280. 14 “Notes of the Game,” Chicago Tribune, July 29, 1888: 14. 15 Ryan did get his first hit, a single, while playing center field, but he hit the double, two triples, and a home run after he took over the mound duties. 17 Lady Baldwin died on March 7, 1937, in Hastings, Michigan, and is buried in the Riverside Cemetery there.